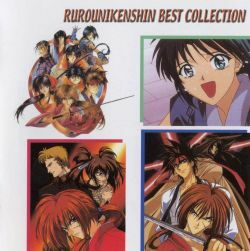 As shown on its cover, this pirated album consists of OP/ED tracks from “Rurouni Kenshin – The Best Theme Collection” (top-left), L'arc~en~Ciel's Kenshin-related songs (“the Fourth Avenue Cafe” and "虹") and the Kenshin-related tracks from the Singles “君に触れるだけで / CURIO” (bottom-right) and “ダメ! / You Izumi” (bottom-left). Includes all OP/ED theme songs from Rurouni Kenshin TV and theatrical animation.